I decided to start issuing grades for a few subjects in our homeschool now that my daughter is in 4th grade. Ok, so how on earth do I give grades? I’ve never done this before! I didn’t want to create a complicated system that would fail within a few months. And let’s be honest, if the grading system is complex then I have all kinds of annoying math to figure out for myself. 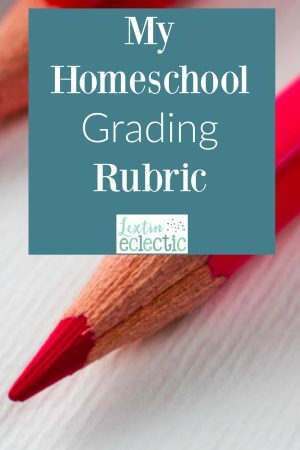 After discussing my grading options with my husband, we both agreed that I needed to keep it very simple for our first foray into record keeping and grades. I decided to create a very simple rubric that could be used in every subject. Every paper is worth only 10 points (easy math, people!). For these points the answers have to be correct (math problems), contain the required elements, (writing and composition) and include correct spelling and grammar. These points includes writing problems and numbers correctly, staying in margins, writing in correct paragraphs, indenting, using a proper outline format, titling papers, etc. Handwriting neatness will also be included in this section. Not every assignment will have this component. However, critical thinking will entail going above and beyond just the simple requirements and demonstrating that thought, time, and effort was put into each assignment. (And if the assignment elicited lots of whining and complaining then these points won’t be awarded….). So there’s my very, very simple grading rubric that will hopefully keep me accountable to grading assignments and enable me to keep grade records for the rest of the year. I’m sure over time the rubric will become more complicated and some assignments may have their own rubric or checklist. But for now I thought we would start with the simplest possible method. So, now I can write down assignment grades on my simple excel spreadsheet and track our progress! Do you need to start giving grades in your homeschool? You can read why I made the choice to begin giving grades right here. This is a great resource if you have older students and are starting to think about high school record keeping. There are also lots of great planners to help you keep organized homeschool records! Try one of these!